Summary BREAKDOWN is a British thriller about a hit man who attempts to leave his criminal life for the sake of his family. 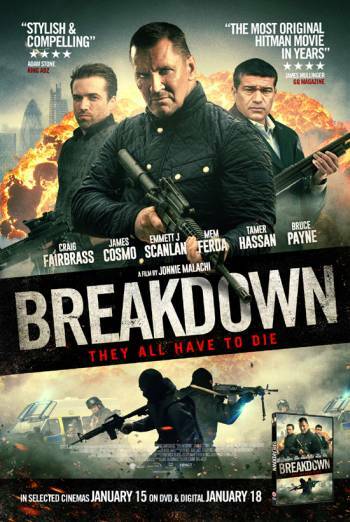 BREAKDOWN is a British thriller about a hit man who attempts to leave his criminal life for the sake of his family. There are two uses of very strong language ('c**t'), as well as frequent use of strong language ('f**k'). There is a scene of torture in which a heavily bloodied man is tied to a chair and punched in the face. It is then implied that the man has his fingers cut off; although there is no sight of cutting, there is gory aftermath detail when the severed fingers are seen lying on the floor. The man is then stabbed to death, but again there is no sight of impact detail. There are also large blood spurts, throughout the film, when characters are shot. A boy is seen spiking a girl's drink with drugs at a party. The boy then takes a pill himself and is seen behaving strangely by his friends, who discover the girl having a fit and foaming at the mouth.